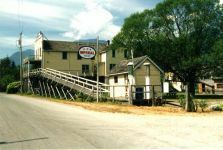 Step back in time and enjoy a leisurely tour of the Kilby Historic Site with its magnificent 1906 General Store Museum. Visitors will view a fascinating gallery of product packaging dating back to the 1920s and 1930s. Don't miss the intriguing artifacts in the heritage Post Office and Manchester House Hotel; both were an integral part of the Harrison Mills community at the turn of the twentieth century. The Museum, Restaurant and Gift Shop are Closed for the Season. However we are always Open for Pre-Booked Tours of 15 people.